When knitting superstar Amy Herzog gets complimented on her hand-knit sweaters, the compliments are often followed by "but I could never knit that." Now, you can! 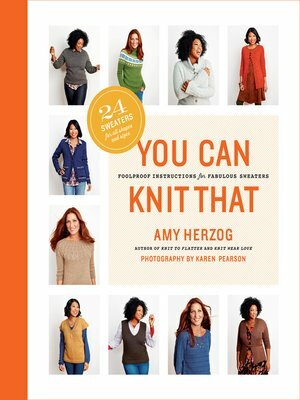 You Can Knit That is a clear, simple reference book and pattern collection that gives knitters the sweater-making confidence they need. Whether you're knitting a sweater for the first time or seeking to expand your skills to knit sweaters in styles you've never tried before, this essential guide starts with basic sweater know-how and moves into instructions for knitting six must-have sweater styles—vests, all-in-one construction, drop shoulders, raglans, yokes, and set-in sleeves. Each chapter offers a less-intimidating "mini" sweater sized for a child and a selection of adult women's patterns in 12 sizes—24 sweater patterns in all, each building on the next, to ensure success with even the most complicated sweaters.